This post is sponsored by Robert Rose Publishing. All opinions are my own. Summer is truly here and I want the taste of an exotic tropical destination for dinner... you know since I won't be traveling to a foreign country any time soon. Thailand may be far away, but the ingredients to make it's cuisine can be found in any grocery store's Asian foods section. Simply Vegetarian Thai Cooking: 125 real Thai recipes by Nancie McDermott is a simple and delicious introduction to Thai cooking. From appetizing salads and savory soups to flavorful and spicy main dishes. This cookbook provides recipes that both vegetarians and meat eaters will enjoy. There are also many vegan recipes too. With fresh vegetables in abundance right now. Thai cooking is the way to really bring out the flavors of farm fresh produce. I only know Italian recipes for eggplant, so I was delighted to cook them with different seasoning. 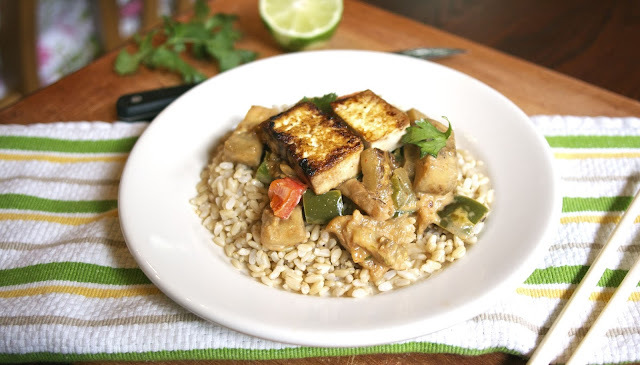 I decided to fry the tofu separately for this recipe because my family likes tofu crispy. Feel free to make any variation you would like on this recipe. 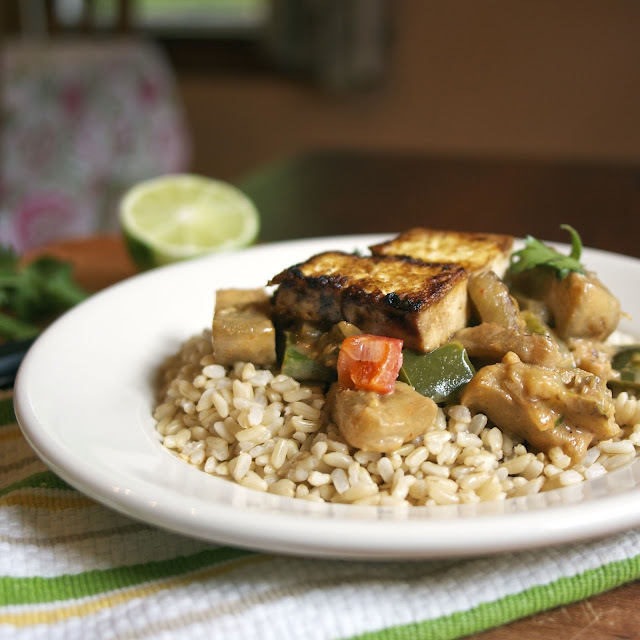 It can be used with whatever vegetables are in season the week you go shopping... so enjoy the change of season with a change of flavors from the Simply Vegetarian Thai Cooking cookbook. 1) Shake coconut milk can well. Spoon out 1/3 (75mL) into a medium saucepan and bring to a gentle boil over medium heat. Cook, stirring occasionally, until thickened and fragrant, about 3 minutes. 2) Add curry paste and cook, mashing and stirring often to soften and combine with coconut milk, about 3 minutes. Add eggplant and stir gently to coat with paste. Add remaining coconut milk, half of the lime leaves, if using stock, sugar, soy sauce and salt and stir well. Bring to an active boil. Reduce heat to maintain a gentle boil and simmer, stirring occasionally, just until eggplant is tender, 10 to 15 minutes. 3) Add tofu, red and green bell peppers and remaining lime leaves and stir gently. Return to a boil and then remove from heat. Transfer to a serving dish, sprinkle with cilantro leaves and serve hot or warm. Meatless Monday: Mexican Salad: corn, guacamole, black beans, tomatoes etc.